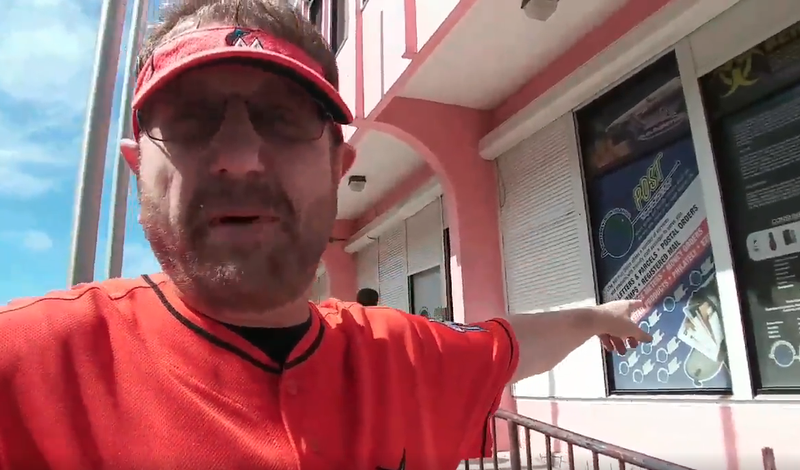 In a move that is equal parts activism, investigative journalism, and performance art, and is rooted in one strange man’s performative loyalty to the least lovable franchise in baseball, Marlins Man apparently flew to the British Virgin Islands and sought the location of the corporate home of the Miami Marlins, to discover what he could about his team’s foreign citizenship. Talk show host Andy Slater accompanied Marlins Man on his international quest for truth. Their discovery? To absolutely no one’s surprise, the Marlins’ corporate address in a Caribbean tax haven is apparently nothing more than a post office box. This may not be much of a scoop, but it is tremendously weird theater. There is something enormously surreal and fascinating about the sight of Marlins Man pretending to be shocked and wounded and disappointed by the discovery, and then immediately passing out Marlins gear to confused office workers. It’s a brutally awkward stunt, revealing nothing, but the Marlins organization absolutely deserves it. Owner Who Sold Off All His Team&apos;s Best Players Wants Team To "Find A Way To Win More Games"